You will receive a full briefing and be provided with a headset with intercom so that your instructor can guide you through all the aspects of flying in a vintage Piper Cub. Then it's "chocks away" to experience a real piece of aviation history across the beautiful English countryside. The Piper Cub is a classic ex military aircraft from the 30s and 40s. This story of the Cub really begins in 1927 when two barnstorming brothers, C. Gilbert and Gordon Taylor, formed the Taylor Brothers Aircraft Company in Bradford, Pennsylvania, to produce and sell a small, high-wing, two-seat monoplane named the Chummy, designed a year earlier by Gilbert. Tragically, Gordon Taylor would soon be killed in an airplane crash, although the Taylor company name would remain. In the autumn of 1930, Taylor embarked on the production of a two-seat tandem low-powered aeroplane, designated the Taylor E-2. The E-2 featured a design with wings mounted high on the fuselage, an open cockpit, fabric-covered tubular steel fuselage and wooden wings. It was powered by a 20-horsepower Brownbach "Tiger Kitten" engine. The Tiger Kitten roared but the little engine was not strong enough to power the E-2. On September 12, 1930, a test flight of the Taylor E-2 ended abruptly when the aircraft ran out of runway—the underpowered engine was unable to lift the monoplane higher than five feet above the ground. Later that year, Taylor Brothers Aircraft Company went bankrupt. The so-called Lindbergh Boom in general aviation following the landmark 1927 solo flight from New York to Paris inspired an oilman, William T. Piper to purchase the assets of the Taylor Aircraft Corporation for $760 as it emerged from bankruptcy protection in 1931. Piper effectively took control of the firm when he assumed the position of corporate secretary-treasurer, although he retained Gilbert Taylor in the role of president. Piper, often called the Henry Ford of Aviation, believed that a simple-to-operate low-cost private airplane would flourish, even in the darkest depths of the Great Depression. Shortly after Piper assumed control of the company, Taylor Aircraft introduced an improved E-2 airframe, powered by the newly developed Continental Motors Corporation 37-horsepower A-4O engine. The new Taylor E-2, now known as the Cub, was awarded its type certificate on July 11, 1931 and licensed by the U.S. Department of Commerce for manufacture. Twenty-two Taylor E-2 Cubs were sold during 1931, retailing for $1,325; by 1935, sales had increased to more than 200 E-2 Cubs. 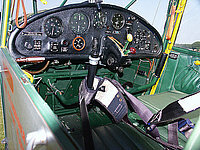 In 1936, an earlier Cub was altered to become the J-2 . 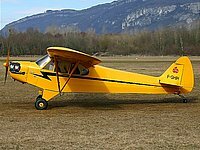 Under the direction of 19-year-old aircraft designer Walter Jamouneau, the E-2 Cub was revamped, with rounded angles and other notable changes, and reintroduced in 1936 as the Taylor J-2 Cub the ‘J' standing for Jamouneau. But the changes to the fundamental Cub design were unacceptable to company founder Gilbert Taylor, who soon parted ways with William Piper —though only after Piper bought out his remaining interest in the company. Taylor went on to establish the new Taylorcraft Aviation Company of Alliance, Ohio. In 1937, the company was hit with a devastating fire. William Piper relocated his manufacturing operation and several hundred employees to Lock Haven, Pennsylvania, and the Piper Aircraft Corporation was born. By year's end, it had built 687 Piper airplanes. After Piper moved his company from Bradford to Lock Haven, the J-3, which featured further changes, replaced the J-2. Powered by a 40 hp (30 kW) engine, in 1938, it sold for just over $1,000. The following year, the upgraded Piper J-3 Cub was unveiled, powered by a 40-horsepower engine built by Continental, Lycoming, or Franklin and selling for $1,300. Piper soon introduced a uniform color scheme for the Cubs—bright yellow trimmed in black. Engine horsepower continued to increase, first to 50 horsepower (37 kilowatts), then to 65 horsepower (48 kilowatts) by 1940. The Piper J-3 Cub is a small, light and very basic aircraft and building this model continued from between 1937 and 1947. It was intended for flight training but became one of the most popular and best-known light aircraft of all time. The Piper J-3 Cub would play an integral role in the success of the CPTP, achieving legendary status. The Cub's basic simplicity and popularity can be compared to the Ford Model T automobile. Its standard yellow paint has come to be known as “Cub Yellow” or "Lock Haven Yellow." The J-3 Cub became the primary trainer aircraft of the CPTP — 75 percent of all new pilots in the CPTP were trained in Cubs. By war's end, 80 percent of all United States military pilots received their initial flight training in Piper Cubs. The need for new pilots created an insatiable appetite for the Cub. In 1940, the year before the United States' entry into the war, 3,016 Cubs were built; soon, wartime demands would increase that production rate to one Piper J-3 Cub being built every 20 minutes. Lilliputian by today's standards, the two-seat J-3 Cub was only 22 feet 2 inches long, stood 80 inches high, and had a wingspan of 35 feet 2 inches. When powered by the Lycoming 65-horsepower engine, the J-3 Cub attained a maximum speed of 85 miles per hour with a ceiling of 9,300 feet Even more remarkable, the fuel tank held only 12 gallons, sufficient to fly about 190 miles —compare this to your modern automobile! A Piper Cub of the 1st Marine Division’s improvised air force snags a message from a patrol on New Britain's north coast. The Piper Cub quickly became a familiar sight. First Lady Eleanor Roosevelt took a flight in a J-3 Cub, posing for a series of publicity photos to help promote the CPTP. Newsreels and newspapers of the era often featured images of wartime leaders, such as Generals Dwight Eisenhower, George Patton and George Marshall, flying around European battlefields in Piper Cubs. Civilian-owned Cubs joined the war effort as part of the newly formed Civil Air Patrol (CAP), patrolling the Eastern Seaboard and Gulf Coast in a constant search for German U-boats and survivors of U-boat attacks. Piper developed a military variant ("All we had to do," Bill Jr. is quoted as saying, "was paint the Cub olive drab to produce a military airplane"), variously designated as the L-4, O-59 and NE-1. The variety of models were collectively nicknamed “Grasshoppers” and were used extensively in World War II for reconnaissance, transporting supplies and medical evacuation. L-4s were also sometimes equipped with lashed-on infantry bazookas for ground attack. Mechanically identical to the J-3, the military versions were equipped with large Plexiglas windows extending over the top of the wing and behind the rear-seat passenger, and the side windows were enlarged. In Europe, the final dogfight of WWII occurred between an L-4 and a German Fieseler Fi 156 Storch. The pilot and co-pilot of the L-4, Lts. Duane Francis and Bill Martin, opened fire on the Storch with their .45 caliber pistols, forcing the German air crew to land and surrender. The need for new pilots created an insatiable appetite for Piper Cubs. In 1940, the year before the United States' entry into the war, 3,016 Cubs were built; soon, wartime demands would increase that production rate to one Piper J-3 Cub being built every 20 minutes! A total of 14,125 Piper Cubs were built between 1939 and 1947—a testament to its wartime versatility. The manufacturing capacity that churned out record numbers of Cubs during the war was quickly exploited to satisfy the consumer demand for light aircraft in the subsequent years. The affordable cost of the J-3 Cub in postwar dollars, $2,195, was carefully priced to be within the reach of a returning war veteran pilot. The postwar sales which hit a high in private aircraft dissipated as quickly as it took off. Piper Aircraft ceased production of the venerable Cub to focus on the development of its popular and more advanced Vagabond, Pacer and, eventually, the TriPacer models. The era of the Piper Cub was over but its influence on aviation will never be forgotten. In the late 1940s, the J-3 was replaced by the PA-11 (1,500 produced), and then the Piper PA-18 Super Cub, which Piper produced until 1981 when it sold the rights to WTA Inc. In all, Piper produced 2,650 Super Cubs. The Super Cub had a 150 hp (110 kW) engine which increased its top speed to 130 mph (210 km/h); its range was 460 miles (740 km). Modernized and up-engined versions are produced today by Cub Crafters of Washington and by American Legend Aircraft in Texas, as the Cub continues to be sought after by bu sh pilots for its STOL capabilities, as well as by recreational pilots for its nostalgia appeal. The new aircraft are actually modeled on the PA-11, though the Legend company does sell an open-cowl version with the cylinder heads exposed, like the J-3 Cub. An electrical system is standard from both manufacturers. So popular is the J-3 as a subject for radio controlled model aircraft that manufacturers of R/C heat shrinkable iron-on covering film and similar fabric coverings produce it in a readily available Cub Yellow hue. The J-3 is distinguished from its successors by the exposed cylinder heads. There are very few other examples of "flat" aircraft engines (as opposed to radial engines) in which the cylinder heads are exposed. From the PA-11 on through the present Super Cub models, the cowling surrounds the cylinder heads. A curiosity of the J-3 is that when it is flown solo, the lone pilot normally occupies the rear seat for proper balance, to balance the fuel tank located at the firewall. Starting with the PA-11, and some L-4s, fuel was carried in wing tanks, allowing the pilot to fly solo from the front seat.